This is for you; parents and children, please share your experiences with us. Your testimonials are very important to us so we can improve our work and costumer service. 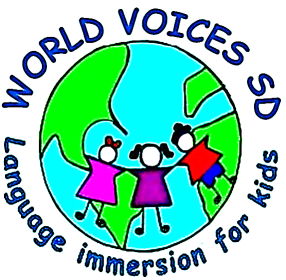 If you would like to share your stories so we can post it on our page please send an email to info@worldvoicessd.com We will post it in the next 24 hours. i have to tell you, how amazed I was with everything you do! The kids love you and you now exactly how to work with them. thank you for this amazing experience, they have lots of fun and they are gonna miss you and the counselors at the camp! We LOVED the camp!!! wish there were more weeks!! my kids are still singing the cocodrilo song....really thought it was great. would be very interested in your programs but think you should offer programs for advanced language students--do you? I just wanted to let you know how grateful I am to know you. The boys so enjoyed camp with you and Margarita and...they love to show everyone their artwork and...I'm just happy we found a way back to you so thank you for everything. You put your heart and soul into everything you do and it shows. Thanks to Alex for helping out and I just want you to know how very much you're appreciated. I just wanted to let you know about Martha's language classes. They are by far the most enjoyable classes I've ever been a part of with my boys. They are learning so much and the improvement in their Spanish is all due to how amazing this program is--- it's so hands on and I love it. I can't tell you enough great things about her classes---you need to see it for yourself. I value the time and opportunity that Alexander has to take Mandarin and he is doing so well. I know he likes it. I am glad the class size is small because i think it would be more difficult to teach if there are more kids. Nate is so excited to be taking Spanish classes with you. We were blessed to meet you the day before the new class began!